Twin car bombings killed at least 27 people and wounded more than 30 in Benghazi, Libya, Tuesday. The first car blew up outside a mosque in the al-Salmani neighborhood. A second bomb went off at the same spot about 30 minutes later with the apparent intention of killing police and rescue workers. Benghazi was at the center of three years of fierce fighting between extremists and forces loyal to military strongman Khalifa Haftar. He declared the city liberated last year. Libya has been in chaos since longtime dictator Moammar Gadhafi was toppled and killed in 2011. 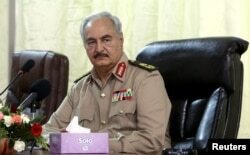 Haftar heads a government based in eastern Libya, while an internationally recognized administration has been set up in the capital, Tripoli, in the west. The western government has struggled to assert its authority across the country. The uncertainty in Libya has opened the door to terror groups such as Islamic State militants to set up camps.